Heather was invited to present at the Royal Architectural Institute of Architecture's annual Festival of Architecture, held in Ottawa this year. As moderator for "People First: Danish Approaches for Well-being and Quality of Life," Heather discussed Danish approaches to the nexus of architecture’s added value; socially, environmentally and economically. 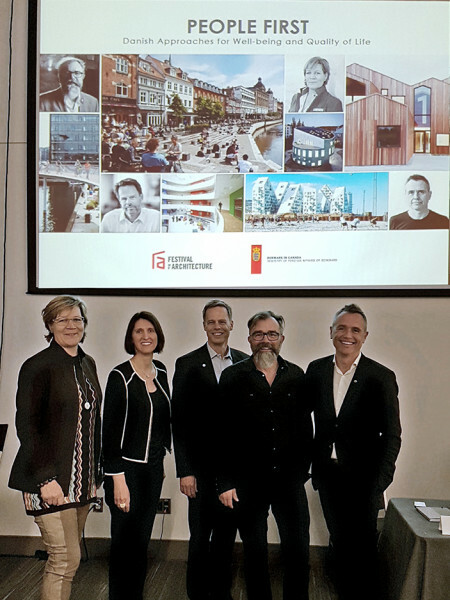 She was joined by an esteemed panel of speakers, including Kolja Nielsen, founding partner and CEO at the Danish architectural office CEBRA; Lone Feifer, Programme Director, Sustainable Living in Buildings, VELUX GROUP; Lars-Emil Kragh, Head of Business Development, Danish Association of Architectural Firms; and Stephen Willacy, Chief City Architect of Aarhus.